USER SCORE:56%The percentage of users who liked this based on high quality reviews from sources such as Google Play, iTunes, and Amazon Music. Above 75% is green. ? Weezer (Black Album) is the 12th studio album by Weezer, released by Atlantic Recording Corporation and Crush Music on March 1, 2019. What you will find in it is nothing but the usual Weezer pop-rock formula. The Black Album feels like the most fully realized latter-day Weezer album. If you’re still listening to new Weezer albums in 2019, you’re along for the ride. Their latest in a line of self-titled, parenthetically colour-coded discs returns to originals – sort of. If it's a joke, it ain't that funny, and if it's for real, let's get that $10 million offer back on the table. The Black Album may be the straw that breaks the camel’s back. A bunch of bad ideas only redeemed to mediocrity by the fact that Weezer can still construct a decent tune. How foolish I was. Years of anticipation have led to one of their worst albums or, if nothing else, their most disappointing. The Black Album sounds scattered, as if the comedy is beginning to lose definition. Another edition of their signature precise, poker-faced California pop-rock. The Black Album may be a desperate cry for relevance in 2019, but it’s not one that’s suitably built on or realised in any way, shape or form. The Weezer of Black Album makes songs about youth without sounding human. Weezer reflects on their own capricious history, using a blunt force the likes of which they’ve never deployed before. Weezer still maintain the ability to surprise, and even brush with something transcendental in a bridge here – oh, say, "High as a Kite" - or a chorus there. Too many mediocre songs are heard. Frontman Rivers Cuomo is restlessly enterprising on the Black Album, fitfully brilliant and frustrating. It's like watching a friend you love making a really bad choice. At its sometime best, The Black Album sounds like a California rock band trying to figure out what exactly living in California and playing in a rock band actually entails. Much like 'Pacific Daydream', 'The Black Album' fails to find its voice on almost every single track. It’s a decidedly enjoyable listen with some infectious pop/rock anthems that will no doubt be fun to see live on Weezer’s upcoming tour dates with Pixies. What The Black Album proves is, maybe pure craft only takes you so far. On the innovative Black Album, the pop-rock greats serve us a selection of well-evolved bangers. Weezer specialise in semi-comic singalongs. The LA band have made a wilfully goofy album whose jokes wear pretty thin, pretty fast – though this is a largely solid alt-pop record nonetheless. The black album reflects the feeling of the current urban life at night. It is remarkable how unspectacular the music behind the really successful artwork is. Apart from "Can not Knock The Hustle" we secretly hope that no other number will reach the set list of next summer. Triumph and misery are always close to each other in Weezer, but nowhere near as close as on this record. This is the most disjointed record in Weezer’s discography. 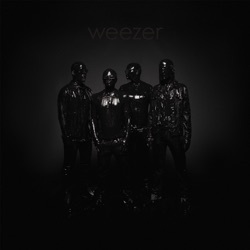 "The Black Album" looks like a condensed product of the last three Weezer projects. At times, the Black Album feels like an awkward band trying to hang out with ‘the kids’, at others, it feels like a brilliant mind trying to work out where it fits in the modern world. That’s so Weezer. The ‘Black Album’ is another dagger in Weezer’s declining legacy. ‘The Black Album’ is the perfect example of a band clinging on to relevance, frantically trying to keep their heads above water. “The Black Album” shows that Weezer is happy to experiment, but it may be even happier to fuel the “SNL” debate. Weezer's latest is an utterly skippable collection that'd be entirely unremarkable if not for the fact it was released by Weezer. Better luck next time, Rivers. Lots of instrumental detail, but when the songs aren’t banal, they’re simply meaningless. "Weezer (Black Album)" remains a nice pop-rock-record, which especially in the second half presents a bit more rock than pop and the decided feeling of the band for melody, but unfortunately slips a bit past the actual concept. Most of Black Album sounds like a regression for Weezer, a return to a sound that they already tried and failed at once before. If Weezer’s cover of “Africa”returned the band to being a household name, “The Black Album” will solidify that status and capture the hearts of fans new and old. As a collection of syllables, it suffices. This is a unique addition to Weezer’s discography that sees them preparing for the future, however bleak and overwhelming it might seem. 2 Weezers?? The band Weezer that put out Pinkerton is going to be pretty upset when they see another band is using the same name. Good thing they sound nothing alike so people won't be confused. Not your best. Or your’s for that matter. I don’t believe in the concept of “selling out.” To the reviews here stating that is the case 1.) They don’t need the money. Their back catalogue makes them plenty. 2.) If in your mind a change in style is selling out then that happened for them years ago. Possibly before you even started listening to them. I’m giving this a low rating because it’s garbage not consumable for any music taste. If you’re going to leave a review how about writing something that doesn’t parrot every teenager ever and instead sound like you have original thoughts of your own. CAN NOT WAIT I love how unique the 2 songs we have right now sound and I’m so excited for the album. This is going to be amazing.